Make a hymn sound alive by using different techniques such as chord substitution, rubato piano playing, inversion, etc. The course comes with four DVDs (six hours video lessons), one 50-page manual and free bonuses. The downloadable version is available. 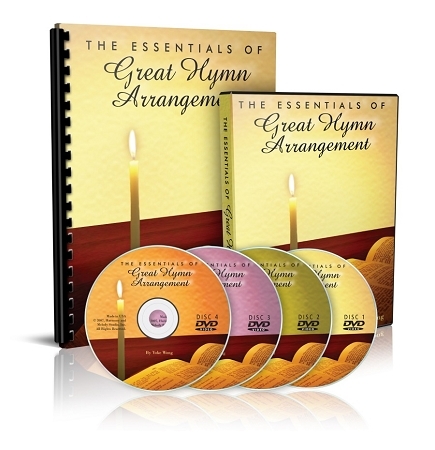 I purchased the "Great Hymn Arrangement" course and have already learned so much! Ms. Wong is an incredible teacher and performer. I could write a book on how happy I am to have discovered her courses. I thank her so much for sharing her knowledge and talent. I picked up some techniques from your lesson. I like the arrangement for hymns especially for "Near the cross" and "it is well with my soul". I am greatly enjoying your course "The essentials of Great Hymn Arrangement." I have learned the first hymn completely and every time I play, I just feel so accomplished. I thank you so much for it. You are a great teacher. God bless you. A lot of things make sense after you explained the theories behind. Your "The Essentials of Great Hymn Arrangement" is exactly what I'm looking for. I'm very excited to learn all the techniques you showed in the DVD. I'm still a beginner, some of those is probably too hard for now, but I hope I will be able to play in the future. You are a very good teacher. A lot of things make sense after you explained the theories behind. Thank you! I am having fun with the DVD's. I am so impressed with the references and links Yoke has given us and the little pep talks and tips she gives in the manuals. Well I am of the feeling that God led me to her, to help me with my hymn playing as one of my dreams it to become an accomplished organist for the Church. I have certainly improved tremendously...I'm so excited.